Wow! This looks like a typical tattoo. Big red heart pierced by an arrow. 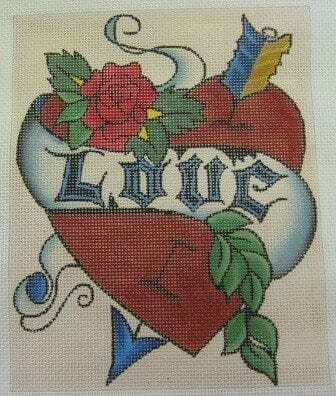 Around the middle of the heart is a banner with the word love printed in the middle of it and above that is a rose. 13 count canvas would make a cute pillow for that rebel teenager or man in your life. If you always wanted a tattoo but were too afraid to try, this might be the answer! Painted on 13 ct, this measures approx. 7-1/4″ x 9″.